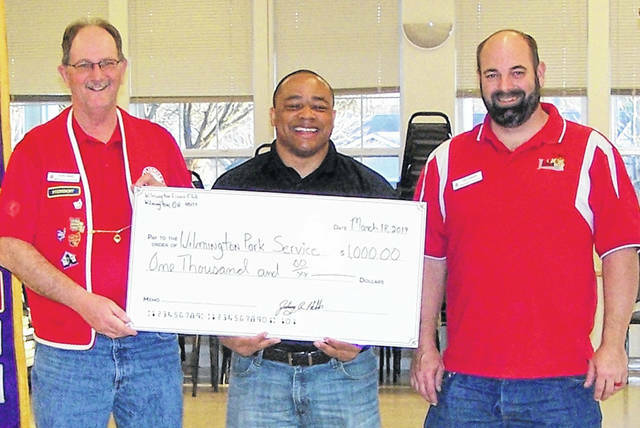 At the Monday night Lions Club meeting, Club President John Hibbs, left, presented Wilmington Parks & Rec Superintendent Jermaine Isaac, middle, with a $1,000 check for the Castle Park II Project. Lion Tony Winner, right, made the donation request at the Lions Club Board of Directors meeting. In addition to the Lions Club financial support, some club members expressed their desire to provide physical help during construction during build week in May.